Rangers have refused to divulge details of chief executive Graham Wallace's bonus entitlements following a demand by supporters groups. Previous executives Charles Green and Brian Stockbridge received 100% bonuses for promotion from the Third Division. Fans want to know if such contracts are still in place at a time when the business continues to lose money. The Union of Fans also wants Wallace to respond to questions posed by prospective Rangers investor Dave King. Rangers' interim accounts, published last month, revealed losses of £3.5m for the six months to 31 December and going concern status was only granted on the basis of predicted rises in season ticket renewal prices and season ticket sales. The latter currently seems unlikely, with disaffected fans being urged by King to pay their renewal money into a trust and the money only being passed to the club for season tickets in return for security over the property assets. Wallace was bullish about the club's future when he unveiled online casino firm 32Red as the new shirt sponsors, with a three-year contract, but the financial picture at Ibrox remains fraught. The Union of Fans, a coalition of supporter groups, is now calling on the chief executive to reassure the support that the bonus culture has been removed from the upper echelons of the club. 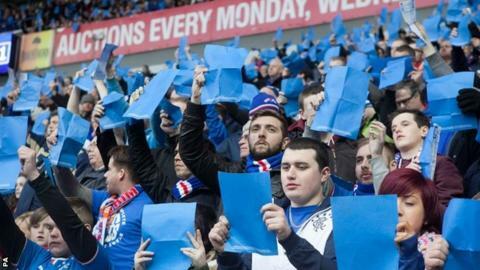 "The Union of Fans has many shareholders amongst its ranks and we have been contacted by a number of them to express their concern regarding the bonus culture which has been prevalent within the Ibrox boardroom over the past couple of years," the group said in a statement. "There has been no clarity on the terms under which new executive directors have been appointed. Most notable amongst these is obviously the CEO, Graham Wallace. "We would therefore urge Graham Wallace to disclose publicly whether or not he has ended the bonus culture within the club or whether it has continued with new appointments. "We do not feel that, under circumstances in which the club is losing large amounts of money on a monthly basis, shareholders should have to wait until the audited accounts are published to find this out. These accounts will not be available until near the end of the year. "Can Mr Wallace, for instance, earn an annual 100% bonus on his salary, which it has been said is in excess of £300,000 a year? Or has he ended that type of bonus culture within the Ibrox boardroom?" Wallace embarked upon a 120-day review of the business following December's annual meeting of shareholders. The deadline was Thursday 17 April, but an update will not be released to supporters until 25 April. King has urged fans not to renew their season tickets until the board has outlined how they intend to fund the investment required in the team, the football infrastructure and the facilities to allow Rangers to return to the top flight in a competitive state. The businessman also asked a series of questions of Wallace, including if the board were seeking financing following the AGM, while the chief executive was at the same time publicly assuring supporters that there was enough cash in the bank to take the club through to the end of the season. "We would ask Mr Wallace to act on his stated intention to be open and honest with fans and shareholders," the UoF statemetn said. "So far, we have heard a lot of words about engagement and building trust but no real action. If he wants to build trust then he should be happy to rule out that this type of culture is still ongoing. "We also still await answers to the questions posed by Dave King and, in particular, the question regarding Mr Wallace's AGM pronouncements about the cash position of the club, which we do not believe to have been true. "Mr Wallace cannot continue to ignore these extremely serious questions if he expects to build any sort of trust with the fans and shareholders." However, Rangers said in a statement that they would not comment on the details of any employee's compensation. "Mr Wallace, as a director of Rangers PLC, will have his remuneration fully disclosed in the annual accounts in the normal manner," it said.